I sat in the fourth row from the front, right hand side of the center aisle. The lights of the church’s worship center had been dimmed while white-hot spot lights flooded a stage filled with musicians. There was a time I’d been one of them, not all that long ago. A pianist and vocalist, often the worship leader or soloist. But not today. Not anymore. I felt the familiar sting with the memory, but pushed it back down, like packing up last night’s leftovers in Tupperware. Nope, don’t go there, I chided myself. Not today. I tapped into my trademark self-control, keeping all the hard emotions clean and neat. This was a time meant for worship, for focusing attention on God and his goodness. Not a time to rehearse regrets and nurse losses. Pull yourself together, Michele. You’re in public. The worship leader strummed the polished guitar slung over his shoulder, playing a tune I recognized within the first few bars. It was a favorite, one of those songs whose lyrics always stirred my soul and lifted me toward heaven and the promise of something greater. When the leader sang the first words, I joined him, along with nearly a thousand other men, women and children gathered in the dark. Faces turned toward the light, we poured out our hearts in hope and praise. But this time the familiar song and the sound of my own voice obliterated my prior resolve. I stopped singing, unable—unwilling?—to continue. The familiar tune didn’t inspire; it wounded. In the moment, the promise of heaven wasn’t enough. I wanted more. I wanted my voice back. To be able to sing. Like before. But there was no faking it, no pretending otherwise. Most days, I accepted my new voice—or lack thereof. But every now and then, the stark truth struck me in the face once again, surprising me with its force. My brain still knew how to sing, how to get vocal cords and tongue to form words and notes. But what my head knew my body could no longer do. Notes I’d once mastered were now out of reach. Words that I’d once articulated without effort were now impossible to form. Simply, singing no longer brought me joy. Not only had cancer cost me my tongue, but the radiation had burned my throat and vocal cords. Now singing came with a cost, a very real physical cost. And that physical cost came packaged with a potent emotional one. I’d never get my old voice back. 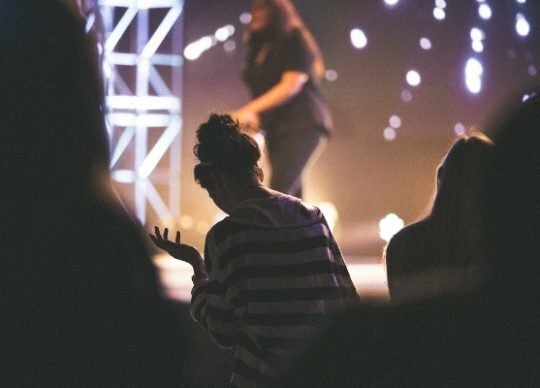 So how does a music-loving girl offer up worship songs when she no longer can sing? I imagine there are more than a few of you who wince at my words. You know this kind of loss, the kind that dramatically reshapes your life, that makes Sunday morning worship songs a little less easy to sing. Those who wanted nothing more than a happy marriage but instead ended up alone. Those who dreamed of having children only to lose them through death or poor decisions. Those who grew up with an innocent belief in a good God but now wrestle with doubt and questions and a fragile faith. Those whose bodies don’t cooperate, jobs don’t pan out, and families don’t behave. It hurts, doesn’t it? The pain won’t be ignored. There aren’t Tupperware containers big enough to contain both the losses and questions. And although you and I can deny it for a day or two, sooner or later the truth interrupts your worship. And you’re not sure you can fake it anymore. I understand. Lately, my well-packaged emotions have been spilling out, hijacking me at unexpected times. It’s messy, ugly, and at times I wrestle against worship. But then I remember the Widow’s Offering. You can read the story yourself, but the short of it is this: In church filled with arm-raising worshippers offering their extravagant gifts, a poor widow came with only two copper coins. It was worth next to nothing, but it was all she had left. I imagine life’s losses had stripped her bare. It had to sting, both the letting go and the humiliation of it. Perhaps the most beautiful worship is the kind that springs from losses. The songs we lift while weeping, the offerings that sting in the giving. I like to think these are the songs that touch the heart of the Savior. Not because He savors our pain, but because He alone knows the kind love that would endure it. The kind of love that would would walk through hell to deliver heaven. I’ll be honest. I still spend a good deal of time longing for what I once had. Daily pain and struggle won’t let me forget my losses. It hurts to remember. And it hurts to try and forget. I’m trapped between what once was and what is. And, at times, when I’m standing in a beautiful church building surrounded by smiling, seemingly unaffected worshippers, I want to sink into my grief and questions, and cling to the little I have left. Haven’t I sacrificed enough? But then I remember the Garden. The Cross. And a Jesus who is tender toward those who give it all in spite of the pain. I still weep when I worship some days. I still wish for a voice that didn’t crack and hurt when I raise it to the rafters. There’s a good chance the people standing in front of me wish the same. Even so, I will keep singing. Even as I struggle and wrestle with questions I can’t answer. Not because I’m noble or strong or super spiritual. Not even close. I will sing because He’s all I have left. And my poor woman’s song is my worship. Michele…you know I have a similar problem. Since surgery my mouth is numb. I cannot articulate words like I used to and the more I talk (or sing), my mouth and face burn. But I always remind myself of something I am sure the Lord showed me when I was in my twenties. I as in church, feeling very sorry for myself. I had good reasons, but my reactions were not of God. I didn’t feel like worshipping. I decided I didn’t need sing. After all, everyone else was. Suddenly my mind grew very quiet. “I know the number of hairs on your head. Likewise, I hear you all worship individually.” I looked up. I never again kept silent. I know that sometimes worship is a sacrifice. A sacrifice of praise. “Through Jesus, therefore, let us continually offer to God a sacrifice of praise–the fruit of lips that openly profess his name.” Hebrews 13:15 Thank you for writing this Michele. It’s been a struggle for me to. I struggle with a constant sense of loss when I want to do something I no longer can do. But it helps to know that when I willing give my heart over to worship, it is an acceptable sacrifice to Jesus. >> Likewise, I hear you all worship individually. Linda, I love this line. I frequently talk with people about moving from the “we” of our worship to the “me” of it. You just articulated that beautifully in one brief sentence. I had an illness also that took my singing voice. I sing,but I don’t think it is strong enough for anyone to hear. It took me a long time to get there. I don’t know if anyone can hear it, but I don’t care, I just want to praise God. In my heart it sounds good. It still hurts, but when I get to heaven I know that all of us will have a beautiful voice. I think now the words of songs means more to me than ever before. aww :). It reminds me of Mary pouring her perfume. I’m sure Jesus treasures your worship in this way. Thanks for your honesty and vulnerability, Michele. I love the idea that perhaps the most beautiful worship is the kind that springs forth from losses. I, too, struggle at times with longing for what I once had – a healthy, strong body that could hike, or ride my bike long miles, or kayack down the river. But in June of 2012, just before my 50th birthday, my husband & I were leaving Yosemeite and had freak accident. One moment we were driving on the mountain road, the next moment, he fell asleep and we hit a tree. I was life flighted from the scene with a broken back. I’m so very grateful we survived, and our marriage is still great. Ha! But my body will never be the same. Pain is always there. I push it out of my mind and try to live in daily grattitude. Still, I have my moments. I read Undone after the accident and started following your blog. Thanks for sharing your journey. Thank you Michele for this open, honest sharing. Although, seemingly intact on the outside, living a life of broken dreams, failed marriages, failed business, loss of all material goods, struggling with an aging & failing body, I find encouragement in your writings when my faith teeters…. You may not be able to articulate your favorite worship song in church, however, God is surely typing thru your fingers to articulate my heart ♥️. I had finished Nursing School (after raising our 5 kids) in December 2015, passed Boards in February 2016, and began working my dream job at a hospital in April of that year. My daughter and I were planning her perfect wedding…..long story short….I was officially diagnosed with Stage 2B Breast Cancer. I am 15 months into this life changing Detour and there are many days that I long for what used to be… my reconstruction will take place in March and I am not afraid, however, it triggers my anxiety and panic. Geez.. I have learned that God is closer to me than the air I breathe and he has a sense of humor that matches mine, and yours! THANK YOU for speaking real life to me and others everyday! Oh how greatly I feel your sorrow-different in some ways but very much the same in others. God had given me a beautiful voice as a young teen. I sang solos in churches, weddings, community events, etc. When I entered college I was unable to major in music because I lacked the proper training or background to enable me to be a music major…thus, I continued to hone my talent with private vocal training. Then I married a self-centered-egotistical man whom believed the world revolved ONLY around him and his idol “money”…we moved from place to place while he always sought greener grass…each time being uprooted from a community, church, etc. The older I became the less I could use my talent, as the “newbie” in a church/community…the countless solos, auditioned choirs and ensembles I had sung with became less and less until there were none. Then after 44 years of marriage and giving up numerous opportunities to serve the Lord in ministries, my husband left me. Any aspiration I had ever had, I had to abandon to be a helpmate for my husband. Then to know after all those years he would leave me has been a struggle. Oh yes there is much more to my story, but I wanted to share the portion of losing my “voice” of feeling that pain when I hear others sing and I’m merely a senior member of the choir. Thank you yet again, Michele, for your brutal vulnerability and transparency. Yes, I have many scars, some that run so deeply they extend through to the other side. One in particular involves loss, a horrible loss that can never be regained. When I allow myself to drown in the morass of my own self-pity, it takes me to a very dark place – a place of anger and resentment. The emotional snowstorm, the finger-pointing, the bitterness of acid that churns in my stomach, the questions of “why” and “what if,” and “why didn’t I…” It is not physically, emotionally, or spiritually healthy to allow myself to drop anchor in this place. How much better to be in that place of gratitude for what I have, rather than anger for what I lost? I am blessed beyond my capacity to understand or articulate. “Rejoice in the Lord ALWAYS, Damon! Hey, I’ll even say it again, ‘Rejoice! '” The fact that Paul phrases it this way teaches me that Joy/Rejoicing is not a feeling, but rather a choice. Feelings come when they come. We have no choice in that. We choose what we do with them, but we do not choose what comes to us emotionally. Rejoicing, however, that is my choice. Whereas sadness and happiness come and go as they will, joy is that powerful undercurrent that is there no matter what else is happening in my life. You’re a precious jewel in the kingdom sister. Thank you for giving of yourself the way you do. Damon, Thanks for your sentence, “It is not physically, emotionally, or spiritually healthy to allow myself to drop anchor in this place.” That mental picture of dropping anchor in a terrible place instead of moving through it gave me a clear vivid image in my imagination. You helped me very much. Would you give me permission to quote you? Thank you Michele. Your devotion touched me deeply. I too was a worship leader and a Bible teacher. But because I allowed my heart to wander and attach itself to a man who was not my husband, I willingly stepped down from both positions. I had a choice. You didn’t. Ten years ago, my husband of 23 years past away while we were separated. Our marriage was a roller coaster of blessing and abuse. I learned a lot about worship during those years. In fact worship was like the buckles on a life jacket that kept me fastened to hope. But as the years past and the waves of emotional abuse kept pounding, the buckles of worship started wearing old and began to slip loose. I lost hope that things would ever change. I realize now that I had failed to trust in and cling to my Life Jacket to keep me afloat even when the buckles came loose. It all is really a matter of trust; Trust that we won’t drown in waves of the unknown, in waves of disappointment and suffering. I trusted more in my own understanding that in my Life Preserver who promised me a future and a confident hope. And when my grip weakened, Gods grip of grace held on to me and has never let me go. I have since remarried. My present husband suffers from severe emphysema and probably doesn’t have much longer to live. But I choose to worship my Savior. He has forgiven me much and still promises me a future and a hope ( a confident expectation and a glorious anticipation.) I worship Him in the storm because I know He is worthy to be trusted and worthy to be praised. He is all I have to cling to. I choose to trust that He will hold me securely in His everlasting arms. Now my heart’s sole desire is to point others to the Preserver of Life and how to hold on tight, trusting in His strength, His sovereign plan, and His precious promises. Sometimes it just comes down to obedience, in spite of my emotions. Yes, I grieve over the loss of not having a sibling that is more like the hallmark cards suggest. I grieve over the lost time with family due to that relationship and trying to avoid constant walking on eggshells for fear of still another conflict. I grieve over the power of addiction and how it has passed down from my sibling to her adult child. I grieve over how it has affected my parents health and well being. How long must this go on? I grieve over my sadness of unanswered prayers. Beautifully written Michele. Life is full of losses, we wouldn’t need Jesus if there weren’t. Offering up the sacrifice of praise gives glory to God and changes us, the hard part is starting. On the subject of mouth issues, I have very dry mouth from autoimmune disease. I recently discovered Throat Coat tea by Traditional Medicinals. The relief is temporary, but it tastes good and does help. Have a blessed day Michele. Praying today for all who commented. I just see Jesus’ heart of compassion. He knows our losses. He knows what we want to give to him. Therefore it’s worth all the more to him. The woman who gave her last mite actually gave the most. He loves us. He weeps with us. Oh, what a Savior! Thank you for this reminder, Michele. As you so eloquently wrote, our wounds are all different. I was exceedingly blessed to be born into a close-knit small family, who worshiped together with music always at our center. Dad was from Wales, where hymn-singing is not only worship but tradition. Dad was a pianist/organist and Taid (grandfather) conducted choirs. I was raised in a traditional church, which had been built in the 1800’s by Welsh settlers in Central NY and which proudly held onto it’s musical Welsh roots. Even the congregation sang in four-part harmony! With my father at the organ and my mother, brother, and me in his choir, I only ever knew how to worship from the choir loft. One night in 1998, my 68-year old father went to bed as usual and awoke in heaven. To say that we were sent reeling doesn’t begin to describe the far-reaching impact of his sudden death. After his funeral, we returned to church and weekly relived our loss as substitute organists did their best to lead worship while my family, the choir and the entire congregation wept through every hymn, anthem, and doxology. Dad and music had been two of the strongest pillars of our church and without him we were imploding. The choir eventually disbanded and, even later, the church actually merged into another congregation. We didn’t know how to worship without our music. I joined a different church, with a choir and wonderful organist, so found my footing again. After many years there, my husband and I have moved out of state and I find myself once again searching for a church with an organist leading the familiar hymns which I know by heart. It’s a very emotional thing for me, which few understand. Mom and my brother have both joined Dad in heaven and there is no place I feel more at home than singing hymns of worship with my church family. My heart so resonates with you. I have a autoimmune disease called Sjogren’s and I do not produce enough saliva to sing/talk for any length of time. My voice gets hoarse with just the little talking I do. I love to sing and worship my Lord. I use to be in a worship team and sing solo’s from time-to-time. Talking about grieving, yes I do many days. I am trying to get beyond this though. Also, I am three plus years in remission from breast cancer. But with the chemo and radiation, my nerves misfire and itch/burn 24/7. I have to wear my clothes inside out because the seams and sometimes the texture of the fabric makes it worse. My digestion is messed up from the chemo, and everything I use to be able to eat makes me have belly cramps which can lead to vomiting if the pain is too strong. Talk about losses, I too wonder how much I have to give up. I get angry sometimes, but I am trying to embrace my life and be content. I am praying for a greater healing to accept the things that I can not change. God Bless You Michelle. I can not even fathom your losses, but I know in my head they are great. Thanks as always for sharing the reality of your struggle. It helps me with mine. Oh friend, a writing my heart needed to read. The image of offering up your sacrifice of pain. And of questioning how much more. But then to see his face and know his sacrifice and understand he’s a “me too” he is an “I get it”. Thank you for putting together words that go deep into the heart. Very well spoken, so transparent and real. I can so relate… After 27 years of teaching 4th grade, my career suddenly ended with Guillain-Barre Syndrome, a debilitating neuro-muscular condition, which reshaped my life. I was literally in a “free fall” posture for a season. “Ruthless Trust” by Brennan Manning was given to me, and it rebooted me all together and gave me great hope. God redirected my life and, in the years that followed, shaped me into a piano instructor out of my own home which I enjoy to this day, perhaps equally as much as the classroom. But who would have thought? I remember those times of loss and near despair as though they were yesterday. I believe God’s message in our hopelessness is, “Hold fast to me, I will bring you through this, I will come for you.” This love of His, it has never failed me. Today, with my loss of voice, inability to sit without pain, and chronic fatique, I adore him, as you do. Real, visible beauty blesses us as you share, Michele. Beautiful. Lately, after the loss of my sister, it’s difficult to worship. In those moments, if I have the strength, I close my eyes, and crawl into His lap. I sit with Him and listen to the praise. My worship is the choice of surrender. You are a beautiful writer and friend. Thank you. Yes i see all these women with babies and my hub and i cant have kids! No at ripe age of 51 will be 52 yrs in few months! Hub 6 years younger! We dont have no children and he dont want to adopted! He want have natural! But i took hormones went specialist on med’s gone 30 lbs and nothing show for! I love watching babies and little kids in church! Try not be jealous! Maybe God dont think we would be good parents! Always wanted twins a boy and girl! But right now just nead prayers on right clients come my way for private care and doing crafts too! Variety clients careing for them and run ing errands too! Just imagine when get up to Heaven if God dont heal you on earth which i think he will how beautiful it will be in Heaven too! This really touches my heart, Michelle. I’m so sorry you lost something you loved so much. I never was a singer like you, but I can’t sing too much anymore either. Because of lung disease, I sometimes start coughing when I try. So I sing in my heart. And like you said, the most beautiful kind of worship is the kind that springs from losses. Thank you for your encouraging words that resonate in my heart. Because of health limitations, I have had to let passions go. Sometimes I wonder why God would take away the very passions He has given us? But like you, I try to look at Jesus and the Cross. Thank you for sharing so honestly. Love and hugs to you! My loss is different but my worship is broken into sobs and heartache. I too used to lead, sing and play. Now that part of me is broken, it just is. Maybe one day our voices will reverberate in angelic joy but for now it is a true sacrifice of praise. Our Father knows our hearts. Love you Michele. Thank you for sharing your heart. Thank you for this beautiful, honest reminder that what is holy and pleasing to God – our true and proper worship – is offering our very bodies as a living sacrifice…Rom12:1 Challenge and blessing. I thought I had moved past the sense of not belonging, and then I stumbled upon something posted on Facebook and it all came flooding back. I know that in Christ, I am wanted, accepted, and identified. I know that in Christ I am a new creation, but the old, hurting heart pounds out a rhythm of ‘unwanted’. I want to be done with this sense of loss and invisibility, and I think I am and then the unexpected happens and there I am again. Finally, I calm my soul long enough to hear my Father’s voice telling me that I am His beloved, that He chose me before the foundation of the earth, and I am defined by His love and sacrifice. I whisper, “But Abba, it still hurts so much.” And He opens His hand, I see the scar, and I know He understands. Thank you for sharing this beautiful reflection. I have been through cancer treatment. It did not destroy my voice, but it changed the range. I can’t hit the high notes anymore, not even in the usual alto range, so now I sing tenor in the church choir (after a year and a half), along with another woman friend whose natural voice is in that range, and also with the men tenors. It’s a challenge to learn the new notes. I’m thankful to still be able to sing anything. This! ? and aching with you, my dear sister! Yet again, as always, you hit the nail right on the head how I have been living and feeling for a very very long time. Thank you for your honesty and openness that have exactly described my inarticulate and inaudible heart and remind me that, although it may often feel like it, we are not alone in our various journeys. You and your gift with words are a true blessing! Thank you for your honesty and your faith in the God Who has given you this story to turn hearts to Him. May He continue to bless your recovery, and ease the feelings of loss in His perfect time. You’ll be singing with the angels one day and I hope I’m standing beside you so we can praise His un-understandable grace and goodness perfectly. God bless you right now. Thank you for sharing your story. I just recently read in my Bible reading about the widow and her 2 mites so this resonates with me. Many years ago I became a young widow raising my 9 month-old-son. Playing the piano was therapeutic for me and even helped my son. Worshipping God through music is a powerful connection to our Savior Jesus. I too played and sang for years at church & eventually I remarried and my husband played bass guitar and was a knowledable sound tech. Due to a situation beyond our control we are no longer serving the Lord in this capacity. We feel empty and grieve the loss of worshipping this way. We sit in seats at our new church and sing but I feel so weak and the loss in serving this way breaks my heart. I am just unable to do it at this time and I miss it so. Friends lament and often comment how much they miss hearing me play piano or how much they miss playing with my husband and me. It is not the same. It has always been humbling to know that something that brought me such great joy would lead others to see Jesus and now that is gone I feel a great void. It hurts. Now I sit and listen instead of lead and for whatever reason God has me in this season I will give my all even though I have so little to offer to worship Christ.